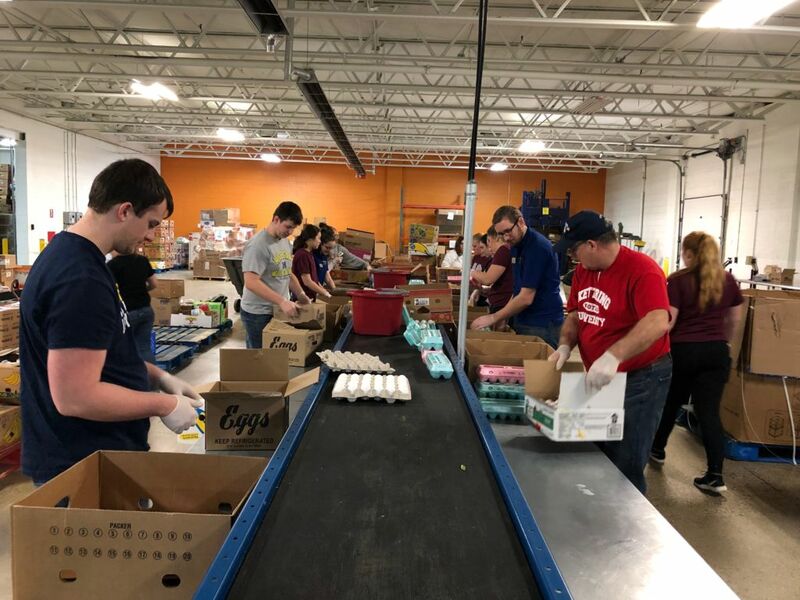 Three Kettering University student organizations spent their Saturday sorting food for distribution at the Food Bank of Eastern Michigan on February 23. More than 30 students from the Student Alumni Council, Alpha Phi sorority, and Delta Tau Delta fraternity, as well as alumnus Frank Krohn ‘77, worked in the Food Bank’s Hunger Solution Center for three hours. Volunteers in the Hunger Solution Center are tasked with sorting donated food to get it ready for distribution to more than 400 agencies that the Food Bank serves in 22 counties in eastern Michigan. Tasks include sorting food by item type and also making sure there aren’t expired or damaged items among the food being packed for shipments. “The Food Bank is really easy to work with, and the volunteer shifts are fun,” Gohlke said. Volunteer shifts are available at the Food Bank Monday-Saturday, and Kettering student groups are regular supporters throughout the year. On Saturday, there were approximately 60 total volunteers at the Food Bank including the Kettering groups. Collectively, they sorted enough food to provide meals for 55,000 people in Michigan. Each volunteer sorts enough food for approximately 335 people per hour during a shift.